L'Aquila Saffron : Peltuinum, Antica Azienda Agricola S.r.l. L'Aquila Saffron (registered in the National Seed Register as Crocus Sativus L cv Piano di Navelli - L'Aquila) is a typical cultivar of the L'Aquila area and is agronomically and commercially distinct from that produced in other areas of Italy and in other countries of the world. For centuries L'Aquila Saffron has been sought after by the world's most demanding gourmets as it is the result of a combination of elements which together determine the excellent and inimitable quality. These elements are: the unique type of cultivation handed down from one generation to another only in this area, the territory and microclimate which are ideal for this type of crop and the hard work every year of the men and women who carry out each stage of the production with love and discipline, respecting tradition. 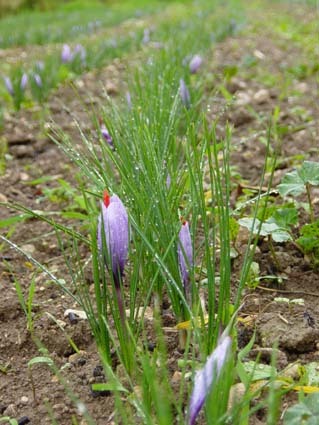 The characteristics of L'Aquila Saffron are the length of the stigmas, the high content of safranal, which gives it its special aroma, the strong colouring effect and the larger bulbs. "Beyond the Persia of Kings, on the first calcareous buttresses of the Oxiana* mountains, grows a little bulb, the crocus sativus. For the whole windy spring and the dry summer it does nothing but survive, slowly vegetating five long, slender greeny-blue leaves streaked with silver. Then, with the first autumn rains, it opens its flower, sometimes turquoise, sometimes purple. The flower has five petals united in a delicate calyx; in this calyx four long stamens, slim as blades of straw, mature from bright yellow to orange. At this stage, before the cold winds that roll down from the peaks of the Hindukush start flattening the grass in the fields, the girls from the shepherd villages scattered across the plateau start gathering the saffron flowers, Zahfran, the hair of angels. It is a task requiring a great deal of patience and virtue and the young girls carry it out with grace and skill, plucking the stamens one by one with their nails. By law, none of them is older than thirteen and none of them has ever touched a man. At the end of the harvest, from the land of a whole tribe, not more than two ounces of dried product is obtained, well protected in little linen bags hung from the ceilings of the huts. Before the coming of the snows merchants do the rounds of the hills taking salt, dried fish, rifles and bullets, to exchange for the white linen packages. When the harvest is good as much as 200 kilograms of spice reach the stockpile in Isfahan, loaded on the backs of camels in little lead cases. There it is auctioned and sent to the trade centres of Samarkand, Cairo and Istanbul from where it is sold around the world. At one stage merchants also thought of taking the seeds of the bulbs with them from Oxiana to try and spread the cultivation of such a rare spice. Unfortunately the crocus sativus is an obstinate little flower which is hard to tame; in the whole world there are only 11 well delimited areas in which the plant has taken root and flourished, yielding eleven distinct types of saffron. Or maybe twelve. In the 18th century a certain Ibrahim Al Barrani, a rich Levantine broker and amateur botanist discovered that by finely grinding the ovary and the corolla of the flowers discarded during the harvest he obtained something which at a glance could be taken for the precious material of the stamens. Since then a small counterfeiting industry has prospered bringing a pale substitute of the real saffron to the saucepans of unscrupulous or naive chefs. Besides this, the quality of the product naturally varies from one area to another. 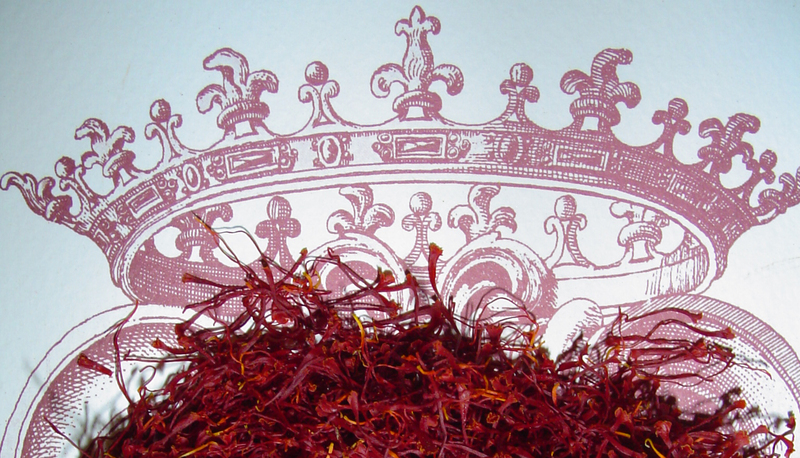 The saffron from La Mancha, for example, is not as good as Persian saffron, while that from Anatolia is even less so; Poitou saffron is more fragrant while that from Mendoza is very dark and pungent. The handful, or little more, of saffron gathered by the children of Zafferana is very rare and considered sacred. Best of all, though, is the saffron from L'Aquila, the famous Abruzzi saffron. The use of this spice is so widespread all over the world that at the end of the last century an international committee was set up to protect it and fix the price. It kept a check on the market and prevented speculation which could have caused irregularities justifying the intervention of an international organism. As far as is known, this committee is still active and the price of saffron, like that of its imitations, has proved to be far more stable than that of the golden metal. The saffron plant, being a sterile triploid does not exist in a spontaneous state and is incapable of producing fruit or seeds. Saffron can only be multiplied by vegetative reproduction and this function is favoured by the cultivation, which in the particular case of L'Aquila Saffron, has become an art. The farmers intervene in the life cycle of the saffron plant periodically, thereby preventing the natural gradual reduction in size of the bulbs left in the ground. They bring them back to their normal size by fertilization and by an annual selection they make them immune from certain diseases, favouring, at the same time, the preservation of the precious morphological and phytochemical characteristics. This is why L'Aquila Saffron is the choicest in the world and therefore the most precious. The type of cultivation determines the difference between the saffron of different origin as regards the morphometrical characteristics which may be different according to the selection based on the cultivation, adaptability factors (climate and soil) and the percentage of certain phytochemical elements contained in the stigmas. The story goes that the art of growing saffron in L'Aquila was perfected in the Middle Ages by a Dominican monk on returning to his native village in the countryside near L'Aquila (which, according to some historians, was Stiffe) from Spain, where he had been on a mission to bring relief with his preaching to the spiritual poverty of the Christian people and to fight heresy. He modified the Spanish farming methods, adapting them to the climate and the soil of the area. In order to do so he developed, for the first time, cultivation based on annual cycles. This farming practice from L'Aquila differs from that of other countries like Spain, Greece, India and Sardinia, where the bulbs are usually left in the ground from 3 to 8 years (plurennial cultivation). To tell the story of L'Aquila Saffron properly one must first take into consideration part of the history of the City of L'Aquila, as the destiny of one influenced the fate of the other and vice versa. The oldest document testifying the cultivation and commerce of saffron in L'Aquila is a diploma issued by King Robert of Anjou in 1317 in which he responds positively to the plea of the saffron merchants of L'Aquila to forbid the local customs officers from exacting a further arbitrary tax levied on precious goods and therefore on saffron as well (Antico Archivio Aquilano, V42, c. 16v-17r). This trade could not have started before that date as it was only with the founding of the city of L'Aquila in 1254 that new commercial activity and agricultural and industrial production, which would formerly have been inconceivable, got under way. The cultivation of saffron would have been incompatible with an economy of pure survival. Thanks to a privilege of 1376 obtained from Queen Giovanna I, with which what King Roberto of Anjou had previously conceded was confirmed, L'Aquila became a sort of bonded area, free from taxes and from which it was very advantageous to import and export goods. Furthermore, the frenetic trade which ran along the Abruzzi road, that is, along the Naples- Florence axis, had brought about an accumulation of capital that had to be re-invested. The merchant-entrepreneurs differentiated their investments, dividing them between sheep, pasturelands, saffron, tax contracts, wool and silk. In this context, to favour the influx of fresh money to re-invest in the area, the citizens of L'Aquila invented and put into practice the 'limited partnership company' which was, perhaps without even realising it, adapted to the old "agistment" contract. At that time L'Aquila was considered the main European centre of production of the precious spice and merchants from Venice, Florence and Milan came to the town to trade. Besides, it is worth mentioning that the Germans from Nuremberg were among the most avid consumers of this spice. They eventually reached a stage where they preferred doing without the mediation of the Venetian traders and, in the middle of the 15th century, established their own representative in the city of L'Aquila. For L'Aquila the 15th century was the period of major economic, cultural and spiritual prosperity: in 1454 Saint Giovanni di Capestrano and Saint Giacomo della Marca started the building of the Basilica of Saint Bernardino di Siena where the Saint's body still lies today. The building of the Basilica was financed partly thanks to the saffron tax; in 1458 King Ferrante I of Aragon signed a decree granting the city the right to open its own university; in 1481 Adam from Rotweil, an apprentice of Johannes Gutenberg's (the inventor of the printing press) opened a printing press in L'Aquila. Everything seemed to contribute to a renaissance of the city: culture, art, spirit, commerce and a general well-being. The historian Gian Michele Bruto, born in Venice in 1515, in the second volume of his Historiae Fiorentine writes: "L'Aquila is a city in Abruzzi, well-known to Italians and foreigners because its inhabitants cultivate saffron in the fertile ground and they send large quantities of it to faraway countries every year. The city of L'Aquila was very fertile and one of the richest in the region because of the large number of people who came from all over to buy saffron, in which, as we said, that territory abounded". The most saffron ever, was produced in the 16th century, precisely between 1583 and 1584. But it was in this very century, because of a series of wars, several earthquakes, the plague and the ever-increasing taxes imposed by the Spanish monarchs, that a slow but inexorable decline in the production of saffron in L'Aquila started. Carlo V, in particular, deprived the city of L'Aquila of the privileges it had acquired in the past and when the citizens made an extreme attempt to defend the same, they suffered a sacking at the hands of Prince Filiberto d'Orange, viceroy of the Kingdom of Naples, who, on behalf of Carlo V, ordered the castle-fort of L'Aquila to be built ad reprimendam aquilanorum audaciam and imposed a retaliation fine of 100,000 scudos needed for its construction. As the inhabitants did not know how to pay this "talion" they accepted an offer from certain German businessmen who were willing to advance part of the sum in exchange for the sole trade rights and control of the price of the L'Aquila Saffron. The passing of time and the lack of a free market caused the production to drop from year to year reaching an all-time low of 1 kilo in 1646 compared to the 4,000 kilos of two centuries earlier. Nowadays L'Aquila Saffron is produced by a handful of farmers located mainly in the Piana di Navelli area and it is sold by a few farm stores like the Antica Azienda Agricola Peltuinum of Prata D'Ansidonia which, rather than focusing on the quantity, concentrates on maintaining the standard of quality which for centuries has made L'Aquila Saffron a unique product, sought after by the most demanding gourmets in the world.